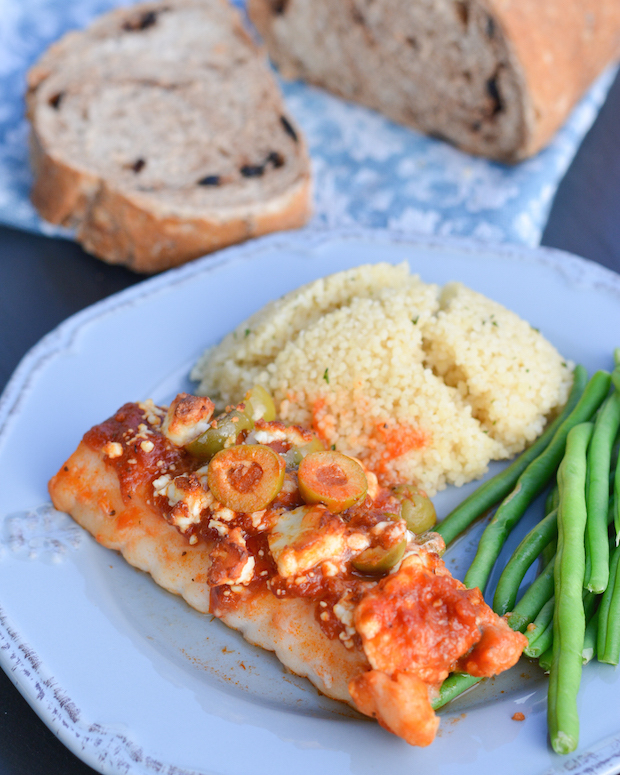 This Baked Mediterranean Cod is quick and easy for a busy weeknight. Frozen fish and a few pantry staples combine to create a delicious meal that goes from frozen to fork in just 15 minutes! 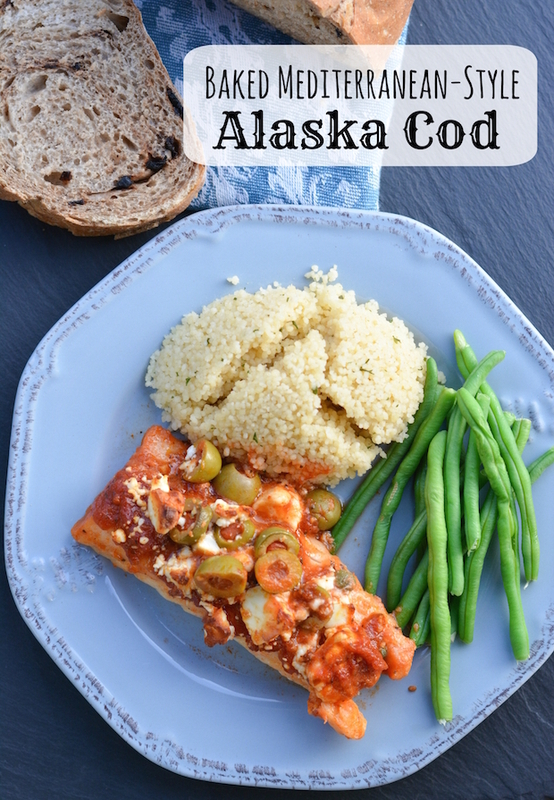 Thank you Alaska Seafood for sponsoring this post. I remember in my early cooking days (or really, maybe even in my pre-cooking eating days), someone telling me that fish and cheese don’t go together. I remember thinking, that’s wrong. Just wrong. I mean, isn’t a warm tuna melt one of life’s great pleasures? And what about the iconic anchovy pizza? Have these people never experienced the magic of lobster mac and cheese? Personally, fish and cheese are among my favorite foods (and quite possibly the top 2 reasons I could never be 100% vegan), and I think they deserve to be together. 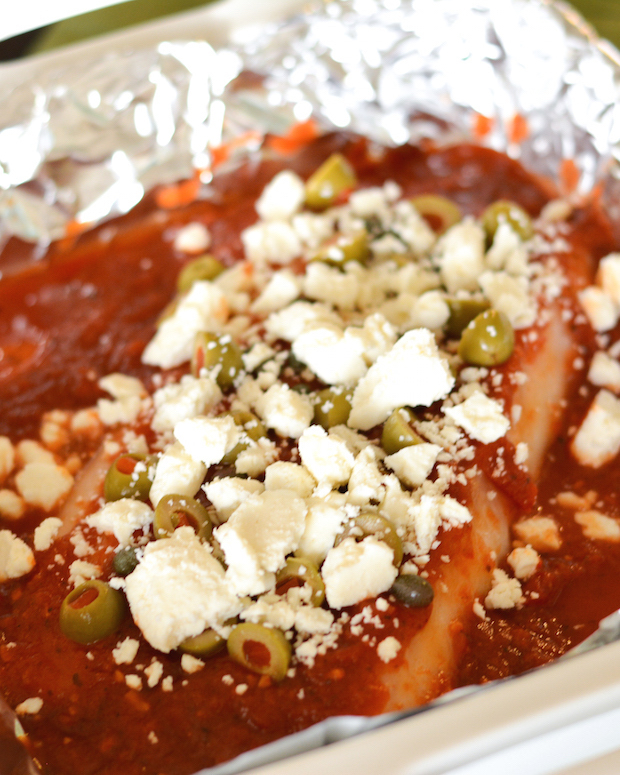 Like in this Baked Mediterranean Cod! 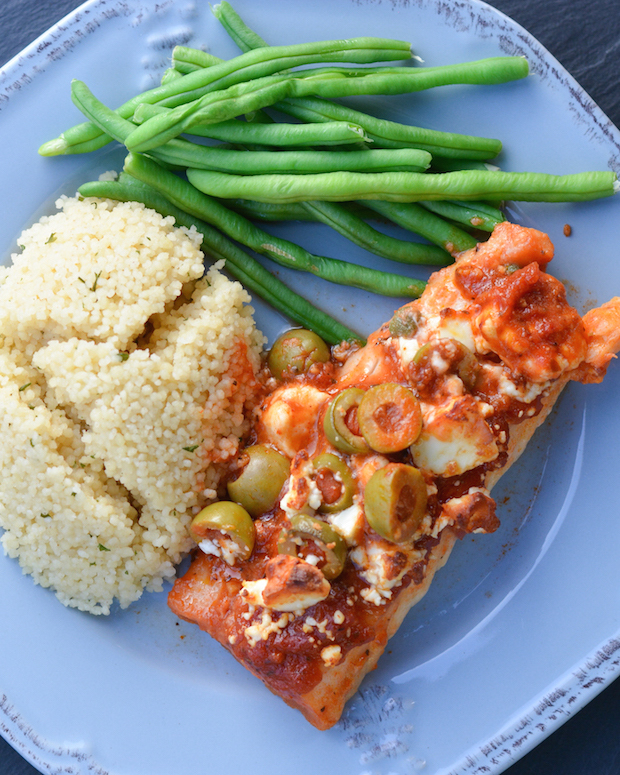 Tangy feta, along with some salty olives and capers, really pump up the mild flavor of cod. And the best part is that you really don’t have to plan ahead for this meal. You can cook the fish directly from frozen, without waiting for it to defrost. That’s one of my favorite things about cooking seafood. It’s really quick and easy to prepare, and can be cooked straight from the freezer in as little as 15 minutes. If you haven’t planned ahead you don’t need to wait hours for that brick of chicken or ground beef to defrost. Speaking of seafood, do you know where yours comes from? Throughout the world there are a lot sketchy farming practices going on, not to mention overfishing that’s depleting our oceans of certain species. It’s important to make sustainable and healthy seafood choices—and always support local American producers when possible! Did you know nearly 60% of all seafood harvested in the United States comes from Alaska? The cold water and natural environment of Alaska produces seafood with lean flesh, firm texture, and superior flavor that is full of high quality protein, vitamins, minerals and oils essential to good health. Alaska produces many different type of seafood, but they are most known for wild salmon, crab and several whitefish varieties like cod and halibut. Nick’s family goes fishing in Alaska every year and brings home a ton of salmon and halibut (and even the occasional king crab! ), so I have been well aware of how delicious Alaska seafood is. When I’m not enjoying their self-caught spoils, I always try to buy the best quality seafood that I can. Alaska preserves its fresh catch immediately after it leaves the icy water by rapidly chilling the catch, then commercially flash freezing at well below zero, ensuring Alaska seafood is kept at the peak of freshness locking in the best quality and flavor. 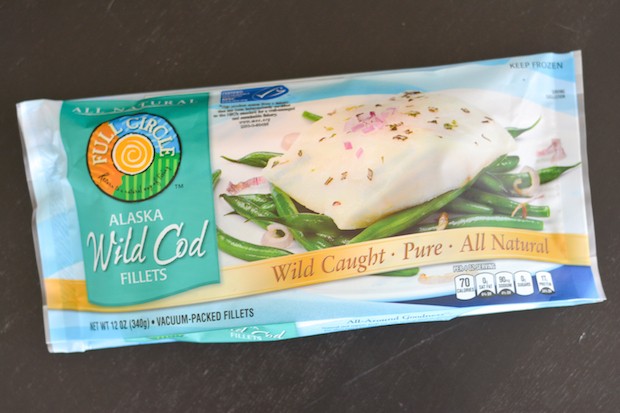 So of course I used some Alaska wild cod for this dish. 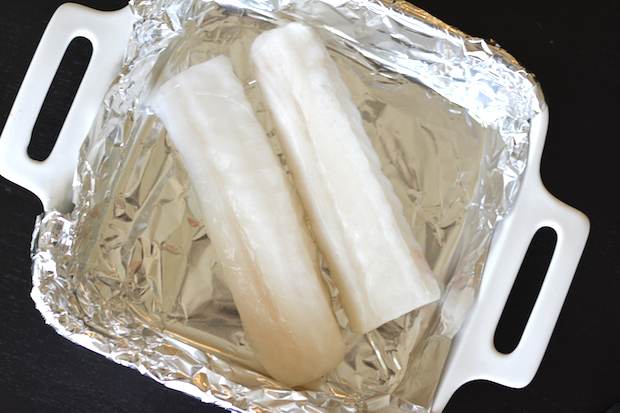 There are many different ways to cook frozen fish quickly, straight from the freezer. Check them out here! I decided to bake mine. I poured some jarred marinara sauce on top, then topped it with green olives, capers and feta. I love the idea of topping the frozen fish with a sauce, since it will soak in the flavors as it’s defrosting and cooking in the oven. Plus the bubbling liquid in the pan helps to keep the fish extra moist. Since the fish comes out so flavorful, with all the salty bits on top, I like to keep the sides pretty simple. Serve the fish with very lightly seasoned couscous or rice, something to soak up all the yummy sauce. And add a veggie too—it could be fresh, but it could also be a frozen or canned veggie. This is a really simple meal that comes together so quickly. It will definitely be going into our regular rotation! Rinse cod to remove any ice, and pat dry. Place in a foil-lined baking dish. Pour marinara sauce evenly over fish. Top with olives, capers and feta. Bake 12-15 minutes, until fish is cooked through and flakes easily with a fork. Serve with couscous or rice, and steamed veggie of choice. The Alaska Seafood Marketing Institute will be hosting 600+ in-store cooking demos throughout the nation in October. Check an see if one is happening near you! This post was sponsored by Alaska Seafood. All text and opinions are my own. You know, there aren’t many fish dishes that have cheese on them, and I’ve always wondered why! I think feta and cod make the perfect combo. This looks so tasty, Jess! Love this! Thanks, Gayle! The flavors really did work perfectly! I never think about buying cod, but it sounds like it would be so good with the Mediterranean flavours you’ve added. Yum! Thanks, Kristen! The toppings really pump up the mild flavor of cod. It’s the perfect combo! I’ve heard that you’re not supposed to mix seafood and cheese too! I think it was a Top Chef challenge once, creating a dish that mixed seafood and cheese. All the chefs were stumped, haha! Too bad they didn’t have this baked cod dish, because it looks like a winner for sure! How could anybody turn down lobster mac and cheese?! Seafood can totally go with cheese! I especially love all that salty feta you put on your fish! Wish I could just stop over and pick some up for dinner! Delish! Feta and olives on cod? I’ve never seen this before and it looks delicious! Yum! Thanks, Amanda! It was so yummy! I think fish and cheese are awesome together! Love the feta and cod combo! Looks fantastic! Thanks, Kelly! I agree, it was a great combo!